In 1950 the Nigerian authorities asked Michael Cardew to become ‘Pottery Officer’ with the aim of improving the quality of the local work. He spent most of the next fifteen years there, having set up the Pottery Training Centre at Abuja. 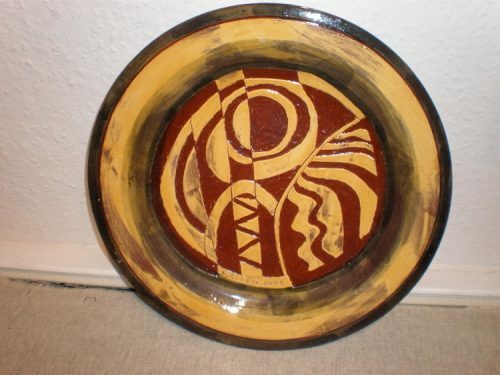 There were exhibitions of Abuja pottery in London in 1958, 1959 and 1962, and another in Lagos in 1960. Cardew and some of the African potters, notably Ladi wali, gave lectures and demonstrations in various parts of the world and Philip Rosenthal sponsored a European tour for them in the mid-1960’s. Upon Cardew’s retirement from the Nigerian Civil Service in 1965 the running of Abuja was taken over by Michael “Seamus” O’Brien. 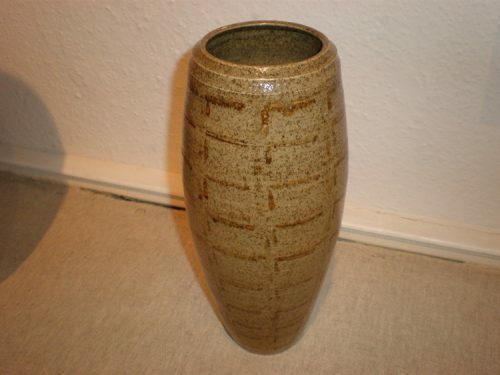 O’Brien was a student of Cardew’s, but had a background in painting rather than pottery. 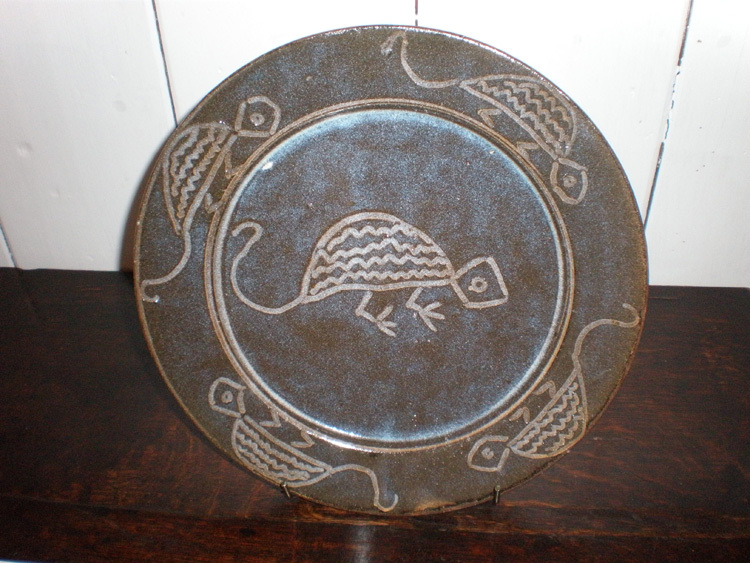 He had to learn on-the-fly, a task made more difficult when he was told that the educational subsidy for training would stop and the pottery would have to make a profit. 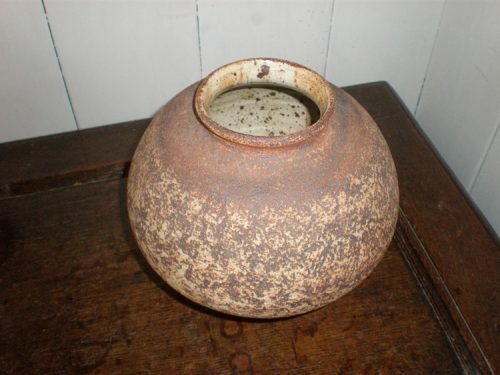 O’Brien stayed until 1972 continuing Cardew’s tradition of encouraging the potters to make their own interpretation and decoration for the simple basic shapes he had taught them. He managed to solve, or partially solve, some of the technical problems that had beset Cardew, and further problems with efficiency were also solved during O’Brien’s tenure. 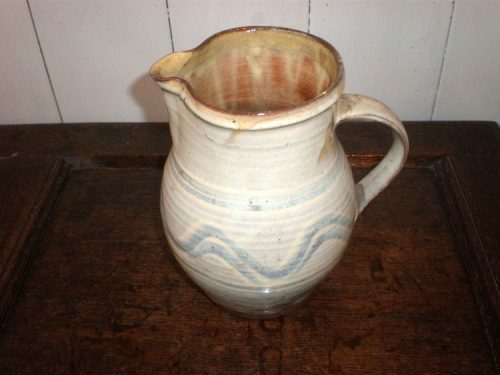 He was concerned that the potters earned five shillings a day, an led a fairly easy life, while farmers were earning two shillings a day and had to find 2-10s once a year to pay their taxes. It was taking the kiln gang – six or seven men – three weeks to cut sufficient wood for a firing. One day he took the laziest man aside and sawed wood with him – one at each end of a bow saw – and they finished the day with enough wood for a firing. The period allowed for the gang to do the work was subsequently reduced from three weeks to three days. In this and other ways O’Brien managed to make the pottery pay its way, or appear to pay its way to the satisfaction of the government. The Abuja pottery, now known as the Dr. Ladi Kwali Pottery, Seleja, is still government ownder, still active, but without the dynamism that made it famous in its early days. The role of oil in the Nigerian economy made keeping the pottery viable less important. Development is to be found in some of the work by potters who once worked at Abuja and have now set up their own workshops.